Keith English was born in Montreal and got his football training at Loyola High School in Montreal, graduating in 1946. After not playing in 1947, English joined the Alouettes in 1948 and was named the rookie of the year in the Big Four / IRFU. Stats are incomplete for that season, but English is credited with two touchdowns (they were 5 points each) and a safety touch for a total of 12 points. English played offensive end where he was a good pass receiver in an era when the passing game was just starting to open up, and a hard tackler on defense. English played four seasons with the Als, and was a member of the first Als Grey Cup championship team in 1949. When the football season ended, English would switch his attention to playing hockey. 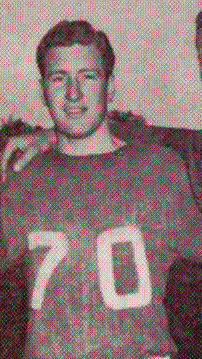 English was one of many Canadian players that the Alouettes lost after the 1951 season. English continued his education while playing with the Alouettes and in 1950 graduated from Loyola College*. In 1972, English was named to the Loyola College Sports Hall of Fame. Keith English passed away on January 21, 1989. * Loyola College merged with Sir George Williams University in 1974 to form Concordia University. Part of what was Loyola College remained as Loyola High School. The Games Played stats are unofficial and are taken from the the 2006 Montreal Media Guide.